Keith Curle admits the Cobblers will ‘pay attention’ to Tranmere Rovers goal machine James Norwood when the two sides meet at Prenton Park on Tuesday night, and has told his defenders they are going to be ‘smart’ to snuff out his threat. Just days after the defensive debacle that was the second half of the 4-0 home defeat to Colchester United on Saturday, perhaps the last thing the Town defenders need is to come up against the leading scorer in Sky Bet League Two. But that’s exactly what will happen at Prenton Park on Tuesday night. Norwood has been a revelation in what is his first full season in the Football League, with his only other appearances coming as a rookie for Exeter City when he was a teenager. Now 28, Norwood has netted 20 goals in 33 starts in all competitions, and 18 in league two alone to lead the scoring charts by two goals from Mansfield Town’s Tyler Walker and Exeter City’s Jayden Stockley. 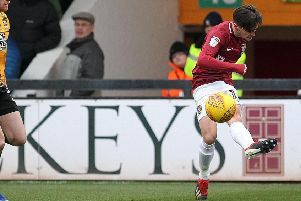 One of those 18 goals came in the 1-1 draw between Tranmere and the Cobblers back in September, so the Town defenders involved that day have had fair warning of what the former Forest Green player is all about. And Curle will be reminding them what the Tranmere man is all about ahead of kick-off on Tiesday. “He is a good player, a good opportunist,” said the Town boss when asked about Norwood. “He will score goals in and around the box, he uses his body well, and he has a good work ethic and a hunger and desire. “He is one of those players you pay attention to, because if you give the opportunity he will hit the back of the net, but then likewise he has frailties in his game. “There are certain parts of his game where you know he wants to operate, so you deny him that. Norwood has been the shining light of a Tranmere side that has adjusted well to life back in the Football League following their promotion via the National League play-offs last May. The Wirral outfit are currently a comfortable 10th in league two, and although they are eight points adrift of the top seven they are not yet out of the play-off picture. They are eight points better off than 17th-placed Cobblers, and Curle believes they have benefitted from the bounce of promotion last season. But the form of Micky Mellon’s side has dipped since Christmas. They have won just once since Boxing Day, and Curle feels that could be down to the pressure of realising the play-offs could be in reach. “I think Tranmere are a team who started the season well, continuing with the buoyancy of winning promotion,” said the Cobblers boss. “In the same way that with a relegation the negativity can have a knock-on effect, gaining promotion from the National League can have a knock-on effect with the confidence levels. “They are now probably coming into a period of time when they may get a little bit anxious because they are in within touching distance of the play-offs, and the desire and wishes may change. “That can have a mental impact on some players because sometimes when you want something that badly, you don’t know how to get it.